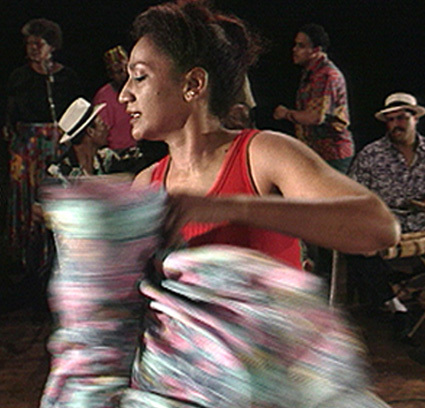 Bomba – Dancing the Drum is a one-hour film about the legendary Cepeda family, known as the “patriarch family” of bomba, Puerto Rico’s richest musical expression of its African heritage. For nearly a century, the Cepeda family has been in the forefront of the struggle to keep the bomba tradition alive in Puerto Rico. Don Rafael Cepeda, the 86 year-old patriarch of the family, and his wife, Do–a Caridad, have passed the tradition on to their 12 children, who, in turn, are passing it on to their children and grandchildren. Saturated with the color, music, and dance of Puerto Rico, Bomba – Dancing the Drum is a portrait of a remarkable family that has chosen to embrace the future with the strength of the past. Roberta Singer, Ph.D., (Ethnomusicology, Folklore) has researched, written about and produced about Puerto Rican culture since 1968 starting with her ground-breaking dissertation about Puerto Rican music and identity in New York City (1982); a concert series of Puerto Rican and Cuban traditional music in New York City (1985-89); “Somos Boricuas” a cultural exchange in new York, Philadelphia and Puerto Rico (1992-94); and co-production of “Somos Boricuas,” a CD by Los Pleneros de la 21 (1996). The documentary “La Bomba” is an outgrowth of Singer’s decades of work in the Puerto Rican community in Puerto Rico and New York. Ashley James holds a Master of Fine Arts degree in Filmmaking and has national television credits. Co-founder, with Kathryn Golden, of Searchlight Films. Former journalist, The Hartford Times, (Gannett News Service)Hartford, CT. Former instructor of graduate studies in the Department of Cinema, San Francisco State University. James is presently Station Manager, KTOP Channel 10 in Oakland, CA. documentary about ex-convicts in Oakland, CA; Director/Cinematographer, Season of Hope~Mothers in Recovery, about drug-addicted young mothers; And Still We Dance, one hour portrait of the San Francisco Ethnic Dance Festival (PBS); Director/Cinematographer, Bomba ~ Dancing the Drum, a one-hour PBS documentary about the legendary Cepeda family of Puerto Rico; Director/Cinematographer, We Love You Like A Rock, about the legendary gospel music group, the Dixie Hummingbirds. James has been Director of Photography and cinematographer on several award-winning films including Isadora Duncan – Movement From The Soul; The Color Of Honor; Ancestors in America; Booker; Crumb; Ethnic Notions and many other films and television programs. His awards include: 2004 National Black Programming Consortium, grant, 2003, Best documentary Black Filmmakers Hall of Fame. The 2002 Trailblazer Award from the San Francisco Black Film Festival; the 2000 Bartok award from the Paris Bilan du Film Ethnographique; 1999 Latino Public Broadcasting grant; 1998 Oakland Artist Fellowship; an American Film Institute Independent Filmmaker grant; a 1992 Ford Foundation grant; a 1991 Western States Regional Fellowship in Film, three CINE Golden Eagles and seven National Endowment For The Arts production grants (Traditional Arts, Programming in the Arts). James is a former president of the Board of Directors, Film Arts Foundation, has been a panelist for the Independent Television Service, the National Endowment for the Humanities (American Studies Program), National Initiative to Preserve American Dance, the Illinois and Pennsylvania Arts Councils and is currently a Governor at the National Academy of Television Arts & Sciences (Emmys), No. California Chapter.